You can use this triangle in many ways. It could become an applique. You could create bunches of these triangles and stitch them together to create larger projects -- afghans, pillows, placemats. Combine this triangle with other shapes as desired to make interesting motifs and vignettes. If all goes according to plan, I'll be sharing bunches of different project ideas (and free patterns) for use with this little triangle -- but please don't feel obligated to wait around for those. Feel free to use this pattern to make your own creative ideas a reality! To crochet the sample triangle, I used a small amount of Cascade 220, which is a worsted weight yarn. Other: You'll also want to have a tapestry needle for weaving in your ends. My sample applique measures about 4 inches tall, and about 4 inches wide at the widest point. If you want a different size, you can easily make larger or smaller triangles just by changing the materials you use. 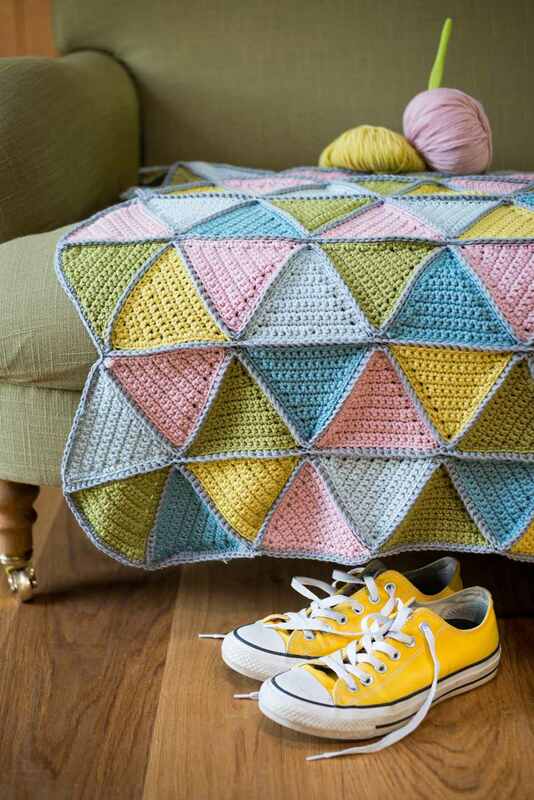 For smaller triangles, try working with crochet thread or fine yarn. For larger triangles, try bulky, chunky or super bulky yarns. For really large triangles, try holding two or more strands of bulky or super bulky yarn together when working the pattern. For most purposes, you don't need to match my gauge exactly to achieve success with this project. However, if you want to use bunches of triangles together in the same project, you do need to match your own gauge so that all the triangles will be the same size, and will, therefore, fit together nicely when you piece them together. Row 3: 1 sc in ea st across the row. You'll have a total of 11 sc sts in the row. Row 5: 1 sc in ea st across the row. You'll have a total of 9sc sts in the row. Row 7: 1 sc in ea st across the row. You'll have a total of 7sc sts in the row. Row 10: 1 sc in ea st across the row. You'll have a total of 5 sc sts in the row. Round 14: Ch 1. Work a round of sl st all the way around the outer edge of the triangle shape, putting 1 extra ch st in corners if desired, including the one at the top of the triangle. The extra chs make the corners a bit pointier, and a bit more pronounced, so that they stand out more. If you don't add the extra ch sts, the corners will appear more rounded than they look on my project sample. End off. Weave in your loose ends.